There are certain key challenges that industrial companies must meet if they are to make the kind of operational improvements that will enable them to outperform their peers. These challenges include improving the overall reliability of the plant, avoiding unplanned shutdowns and reducing the total cost of instrumentation ownership, all of which contribute to improving profitability. The business goals of every organisation depend on the performance and reliability of its critical production assets, including on/ off valves, and correctly-performing devices can play a pivotal role in meeting these challenges. For many years valve controllers using digital communications technology such as the HART� protocol have been helping to ensure devices are operating reliably and are available to perform actions when required. HART provides data access between intelligent field instruments and host systems through two simultaneous communication channels � one analogue and one digital. The analogue signal communicates the primary measured value (PV), while the digital signal contains information from the device, including PV, device status, diagnostics and additional measured or calculated values. Enhanced burst mode, adding variable status to the burst message. Expanded manufacturer ID, allowing new manufacturers to register devices. Increased device output capability from four to eight variables, enabling users to access more information about their devices. Time stamp, allowing users to configure the time between measurements. Device trend tracking, by recording data points. A number of these new capabilities have been adopted into Emerson�s TopWorx� D-Series discrete valve controllers. D-Series devices enable automated on/off valves to communicate via a broad range of fieldbus protocols and HART. They attach to all rotary and linear valves and actuators, operate in the most demanding environmental conditions, and have multiple certification for hazardous area deployment. Products in the D-Series range can be used in applications including SIL 3 Emergency Shut Down (ESD), global containment, and explosive or corrosive environments. Engineered to meet tough applications while offering high reliability and installation flexibility, Emerson�s rugged and affordable discrete valve controllers are designed to provide dependability in all environments. With the addition of a HART 7 position transmitter option, D-series devices now provide additional functionality, including advanced diagnostic and monitoring capabilities that are essential for improved operational efficiency and maintenance planning. Excessive irrelevant alarms can have a negative impact by causing spurious trips that affect maintenance schedules and lead to lost production. Most valve controllers provide only standard programmed alarm settings, which end users cannot shut off, even if they are irrelevant to their particular application or facility. The TopWorx D-Series with HART can now provide intelligent alarms and counters, which can be tailored to suit the requirements of their specific application. Eliminating irrelevant alarms prevents spurious trips and lost production, thereby not only improving operator workload, but also contributing to lower total cost of ownership. A further advantage of the TopWorx D-Series with HART is that it can be applied within hazardous areas, such as Ex db, without the need for an intrinsic safety barrier. This reduces hardware costs, further lowering total cost of ownership. Unscheduled downtime that reduces plant availability and increases maintenance costs is something plant operators continue to strive to avoid. Helping to prevent unplanned events, TopWorx D-series with HART devices feature internal device temperature monitoring. This enables users to take immediate remedial action if the device temperature reaches a designated high point. Such early diagnosis minimises the potential for the device suffering damage that could lead to unscheduled downtime for repairs, and thereby helps to increase availability and overall equipment effectiveness. Increasing the speed of process and diagnostic data throughput is beneficial because it helps identify potential problems earlier. The TopWorx D-Series with HART supports this using �burst mode notifications�. Burst mode provides high-speed bulk data transmission and enables devices to proactively send messages instead of waiting for a host request. The additional functionality provided by HART 7 enables the TopWorx D-Series to enhance its burst mode capabilities by adding variable status to messages, showing the quality of that data. 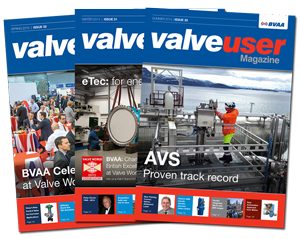 Valve reliability is crucial in helping to maintain plant availability and profitability. 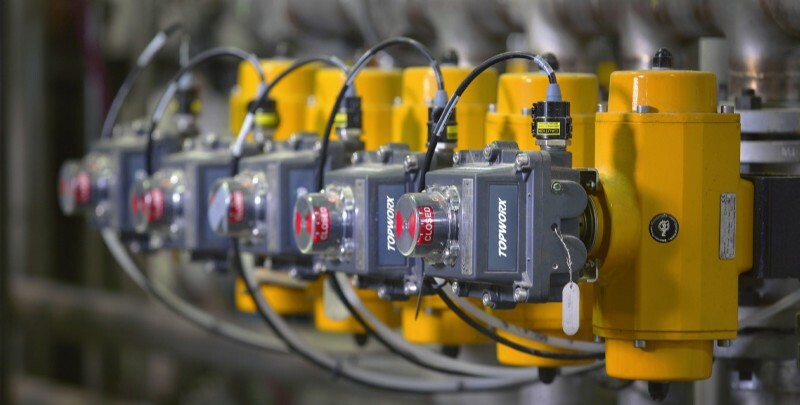 To help improve reliability, the HART 7 position transmitter option enables TopWorx D-series devices to provide fivepoint calibration at 0%, 25%, 50%, 75% and 100% for more accurate set-up on linear applications. 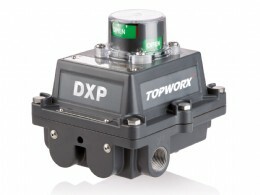 When the TopWorx D-series with HART is used in tandem with a positioner, the positioner receives an AO signal for desired valve position, and the TopWorx HART 7 indicator sends back an AI signal to validate the AO. 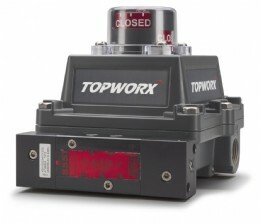 Since control valves and on/off valves have very different valve signatures, the fivepoint calibration option enables the TopWorx indicator to match the positioner feedback signature and provides increased assurance that the valve is working correctly, without having to take it out of service. This also supports more accurate and reliable process control.